You choose which is best for your experience and your project, but we guarantee you’ll be pleased with our chair caning supplies and our instruction booklets. 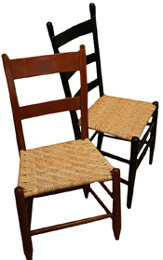 We ship worldwide daily to novice chair caners weaving their first chair cane project and to professional chair caners who have been long time customers. We appreciate all of you, and strive to provide the highest quality of product and service at all times!